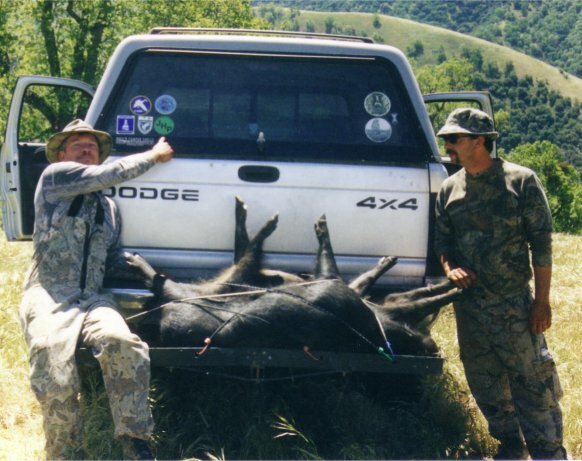 Tejon Ranch Hog Hunt- Pig O Rama! My 114# boar (field dressed). Taken at 25 yards with a Savage 110 in 30-06. Word to the wise: 165 gr. Ballistic Tips are WAY TOO DESTRUCTIVE. 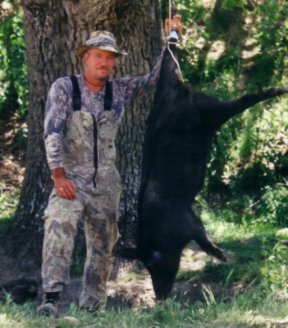 Scott's 109 # boar (field dressed). Taken at 35 yards with a Ruger Super Blackhawk in .44 magnum. One sweet shot with a 240 gr. Remington soft point. The sun has been up for almost an hour, and the canyons have echoed with gunshots since shoot-time began. It's tricky to pinpoint the source, but the majority of them are fairly close. At sunset last night, my brother, Scott, and I counted over 20 hogs moving along these ridges. It now seems that we weren't the only hunters to make that observation. After all the gunshots, I'm growing certain I won't be seeing any hogs in this area. I turn my thoughts to the hike back to the truck. I've hiked down to the very tip of a finger ridge, and now I'm cursing myself for getting so far away. Of course, the return trip is all uphill too. I've been hiking like this all weekend. Each little hill invites exploration, only to find yet another invitation waiting "just over yonder", all the while slowly losing elevation, oblivious to the fact that every step downhill is going to require another step back up. My back aches, my knee is screaming, and my eyes are scratchy from rising at four a.m. and bedding down after midnight for three days running. This is fun? As I brace myself to begin the trek back to the truck, I hear another shot, followed by the squealing of a pig. This one is really close. I'm almost certain it came from Scott's position, a half mile away on the hilltop. Our friend, Russ, is also right in that area. It has to be one of them. A few moments later I hear another shot...the boom of a .44 magnum. That has to be Scott, and he doesn't miss often. I move to the edge of my ridge, and look out in his direction. I can't see him, so I figure he's started down into the canyon to claim his pig. Three pigs suddenly break cover on the adjacent ridge. I drop to my seat and pop out the bipod on my rifle. I'm on a steep decline, and the ground has been seriously loosened by hog rooting. As a result, I'm having a really hard time getting a steady rest without sliding down the hill. For a brief second I have the rear pig in my scope. I start to squeeze, but I'm too off balance and decide to hold off. They are heading in my direction, and I hope they'll keep coming to me and offer a better shot. For a change, the wind is in my favor, quartering into my face as I wait. After a few moments, I fear the pigs have turned and are hiding in the thick brush at the canyon bottom. I mentally kick myself for not taking the shot I had, but just before the psychic foot lands the blow, the pigs burst out of the thicket. They are running right toward me. At about 20 or 25 yards, they turn a bit and disappear behind a bush. I raise the 30-06 and put the crosshairs on the lead pig as he reappears. He hesitates, as if he realizes something is wrong. Maybe he's caught my scent. I don't give him a chance to react. The crosshairs lay dead on his shoulder, and I squeeze off my shot. He squeals and pivots right, then left, as the other two pigs turn 180 degrees and head back down the hill. He follows, and I lose sight of him as he tops a rise and drops down. A second later, I hear crashing near the bottom, and pray that he's not running off with a busted shoulder. I draw my pistol and creep to the edge. About halfway down an extremely steep hillside, he has fetched up against an oak tree. He's trying to rise, so I slide down the hill toward him and put a finishing shot between his ears before he can slide the rest of the way into the bottom. I am suddenly conscious of my labored breathing and the light-headed sensation that comes after intense concentration. Or maybe it's just because I haven't eaten yet. Every big game kill leaves me with a wild range of emotions, but this happened so fast, I can only now begin to replay the sequence of events. I am also suddenly very aware of the task that now lies before me. I have a pig down, and I'm fairly certain that either Scott or Russ does too. The truck is about a half mile away, all uphill. Scott and Russ are hunting a little bit above the truck. I will have to go up to get the truck, go help Scott and Russ get that pig dragged up and loaded, then come back with them to get my pig. As they say, "this is when the work really starts!" 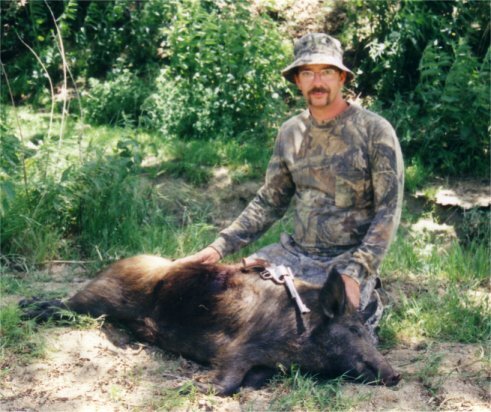 Scott and I had talked about getting together for a pig hunt for a couple of years. Since he lives in North Carolina, coordinating and financing such a trip was no mean feat. I wanted to take him on a hunt where success was more likely than public land, but paying for a fully guided trip (on top of airline tickets) was out of our price range. I had almost decided just to bring him out for a hunt on public land when the Tejon Ranch announced that they would be holding a series of monthly Pig-o-ramas. At $300 for two and a half days of hunting on the beautiful Tejon Ranch property, we found a hunt that fit the criteria. Since the hunt we chose fell in May, near Scott's birthday, I figured the hunt would be a great gift. It was only after we had paid our fees that I realized that the hunt also fell on Mothers' Day weekend. Oops. Fortunately, both our wives are very understanding about hunting addictions and the ground remained relatively smooth (so far). An added bonus to the timing was that several of my online friends from Jesse's Hunting and Outdoors were going to also be at the event. This, as it turns out, was a major factor in our success. Through the list, we made plans to make a group camp. The hunts begin at noon on Friday, and run through the weekend. Scott's plane arrived on Thursday night, late as usual. We made it back to my house by around 1:00 a.m. and tried to turn in, even though we were both too excited to sleep well. After a couple of hours at the range Friday morning, we headed south and arrived at the Tejon Ranch check-in around 5:30p.m. After check-in, finding where the JHO guys were camped (they were all out hunting when we arrived), and setting up camp, we had about two hours to hunt. I drove out, found a likely looking side road, and drove up onto a ridge top. The habitat looked great, and we worked the hillside pretty thoroughly. We didn't see anything, but determined to head back in before first light in the morning, and hunt a little harder. The morning hunt, to shorten the story, was a total bust. The little bit of sign we did see was very old. The pigs just weren't here. Scott and I covered plenty of ground, but returned to the truck exhausted and a little discouraged. We headed out, explored a couple of trails, and then went back to camp for coffee and sandwiches. Around lunch, we talked to some of the guys. Most of them had seen pigs. One of the JHOers, also named Scott, (grtwythunter on Jesse's list) had come out with his wife, Sandy, and they rolled into camp as we were eating. You could see by their smiles that someone had a pig. It turns out that Sandy took a nice boar within 50 feet of the road. It was her first big game kill, and she was beaming (deservedly). As the afternoon wore on, one of the Tejon Ranch employees dropped into the camping area to take pictures. He knew a couple of the guys in our group, and he stopped to talk and have a soda. He asked how we were doing, and then mentioned that some areas were better than others. He also made a suggestion that those of us who hadn't seen any hogs should try some different areas, with a focus on the highest ridges where we would be able to scan the thickets in the bottom of the canyons. It was good advice. Saturday evening my brother and I headed out to the ridge tops. About 4:30 we started to see pigs moving in the thick brush. They were headed for the far side of the canyon, about a mile away. We jumped in the truck and took off to see if we could get ahead of them. We found a ridge that jutted out into the middle of the canyon and practically ran down the hill. Once again, we didn't pay much attention to the fact that we were descending at a fairly steep route. When I called a stop to glass, we realized the wind was rushing right down at our backs. If the hogs were down there, they'd smell us way before we got down. We sat and glassed for about 45 minutes anyway, then trudged achingly back up the hill. I decided to drive into another area since we'd been told that driving and glassing was the most productive way to find game in this big country. At one high point, we saw a herd of about 11 hogs milling about just below the ridge where we'd started! It looked like they were headed right up to the road, so we jumped in the truck and boogied all the way back. We reached our spot and jumped out, rifles and binoculars at the ready. After ten minutes or so, we spotted the herd. They had turned, and were now scurrying back toward the ridge we had just left! Into the truck again, and back around the canyon we went. There was a long, high ridge that looked like the best vantage point, so we climbed up and hiked along the top until we were directly across from the last place we saw the hogs. They had disappeared, but I felt certain that they'd keep coming. We sat and waited, glassing constantly. Around 7:00 I saw three pigs on the opposite hillside, heading up a finger ridge toward the saddle where we'd parked the truck earlier. I couldn't believe it. For the sake of a shorter story (already long, isn't it? ), the 11 hogs we'd seen originally never came out of the brush. In the meantime, we saw several more small groups follow the first three up the hillside....all well within range of the spot we'd originally started from. There just wasn't time to drive all the way back around the canyon before dark. I was disappointed and a little angry at myself for not staying put in the first place, but I was encouraged for the Sunday morning hunt. I was sure there'd be pigs, and this time I wasn't going to drive all over the mountain trying to head them off. Back in camp, several of the guys had taken their pigs. It had been a productive evening, and spirits were pretty high. Our friend Russ, however, hadn't had any luck at all. Over the weekend he had yet to see a hog. He was hindered by the fact that he had a two-wheel drive pickup, and the majority of the sideroads required four-wheel drive. His hunting had been limited to the paved road and the gentler dirt tracks. I offered to let him ride up with us in the morning. My other friend, Scott, decided he would follow me up, and hunt a different section of the same area. I didn't realize it then, but these extra hands would come in mighty handy the following day. So Sunday dawned, clinch time. We hit the ridgetop just before legal shooting light. Scott (my brother) took a spot near the high point. He refused to start the day by walking downhill again. I suggested a couple of areas for Russ to cover, and told them I'd take the downhill hike and head out to the finger where we'd seen the pigs in the evening. The other Scott drove on up the ridge and went to the far side of the canyon. The stage was set, and that takes us back to where this story began... gunshots in the morning light.